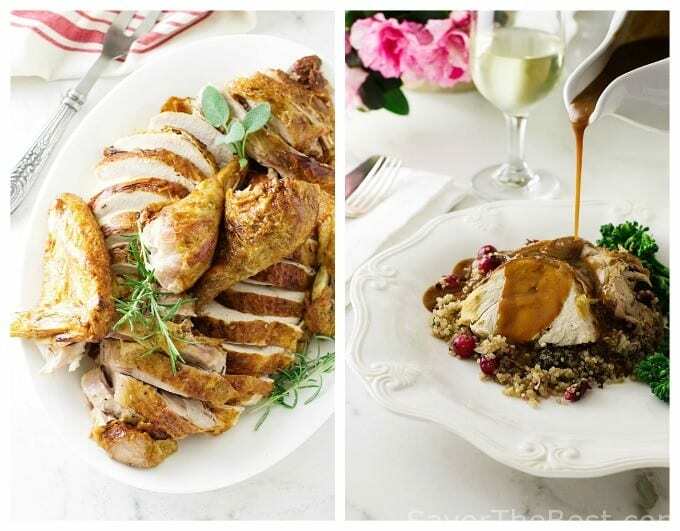 That big, fat roasted turkey is always the main player at our Thanksgiving dinner table. But this year it is not going to be a ‘big fat’ turkey. This year, I am serving a Spatchcock Turkey. 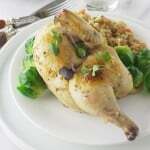 It is a delicious, moist, beautifully browned bird and one of the easiest methods ever! In our family, the stuffing in the roast turkey is considered almost as important as the turkey for Thanksgiving dinner. There will be no ‘stuffing the bird’ for this big guy but we are still having ‘stuffing in a dish’. We will also be serving a quinoa-cranberry pilaf for all the gluten-free guests. So, this year I will be adding a spatchcock turkey to the list. A spatchcocked turkey looks a little ‘odd’ and should be carved before presenting it to the table. It will not be the ‘big fat beautiful bird’ that a traditional turkey presents. I am slightly adapting a recipe in my cookbook, The Food Lab, by J. Kenji Lopez-Alt. 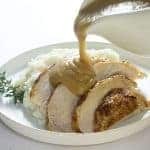 In addition, I have included instructions for a really awesome gravy. What is a Spatchcock Turkey? Another word for spatchcock is butterflied. The backbone is removed and the bird is spread out flat, exposing more surface area to the heat. With this technique, the turkey not only cooks faster but it also cooks more evenly, creating juicy, moist and tender meat. 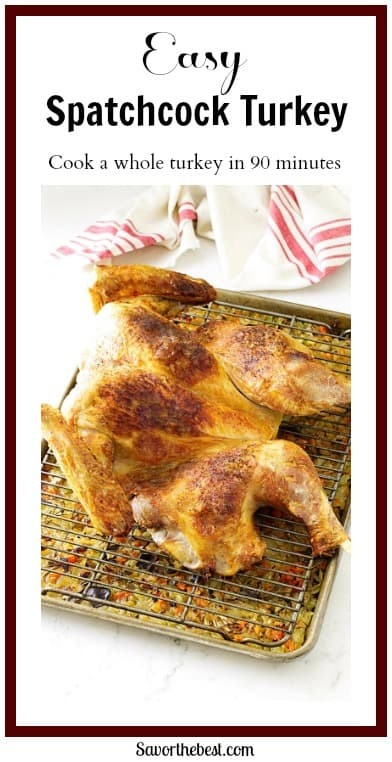 Since it is cooked at a higher temperature the skin becomes beautifully crispy and brown. According to the USDA Turkey Safety Guide, a twelve to fourteen pound turkey, unstuffed, will take 3 to 4 hours to cook. A spatchcock turkey of the same weight, will roast in about 1 – 1/2 hours. Surprisingly, it is not a difficult process and if I can do it, I am confident you can as well. The process requires a good pair of kitchen shears that snip up each side the backbone of the turkey. Next, flip the turkey over, breast side up. A good firm push of your hands on the breast breaks the breastbone and allows the turkey to lay flat. Arrange the legs in a flat position and tuck the wings in. Watch our video below and see just how easy it really is. 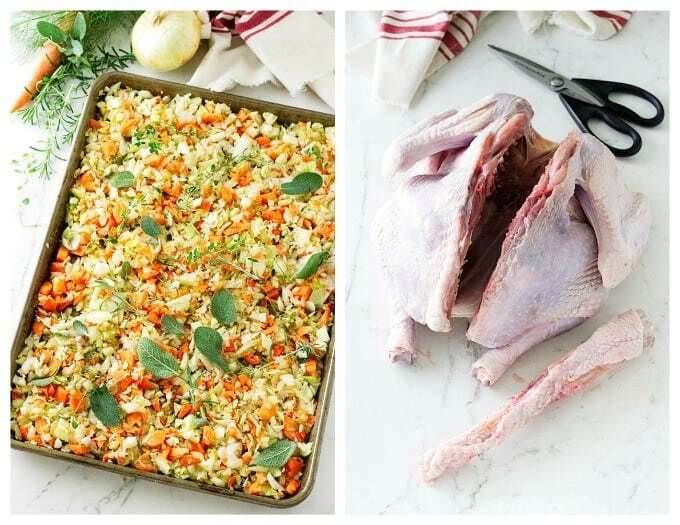 Besides the above mentioned kitchen shears, you will also need a baking sheet large enough to accommodate the flattened-out turkey. I used an 18-inch by 12-inch with a 1-inch rim. You will also need a wire rack the same size as the baking sheet. Choose a reliable meat thermometer, preferably an instant-read thermometer. First, chop the vegetables and add two-third of them to the prepared sheet pan. Spread the vegetables out evenly, and sprinkle with the wine and herbs. Set the wire rack over the top of the vegetables. As the turkey roasts, the juices drip down into the vegetables adding a delicious flavor element to the vegetables. All those yummy vegetables will be included later in the gravy making process. The remaining one-third of the vegetables used for the gravy process. Before you begin wrestling that slippery turkey, spread a kitchen towel onto the workspace and set the turkey on it. This will keep the turkey from slipping and sliding while removing the backbone and trimming off any unwanted fatty flaps. I learned this kitchen towel tip after my first spatchcock chicken danced away from me and flipped onto the floor. Next, turn the turkey breast side down and remove the backbone of the turkey as discussed above and in our video. Also, cut off the tail and remove the neck and giblets from the neck cavity and reserve on a plate. Rinse the turkey under the cold water tap, inside and out, then pat dry with paper towels. Sprinkle the inside of the turkey with salt and arrange on the wire rack over the vegetables. Brush the outside of the turkey with the oil, sprinkle it with salt, pepper and paprika. Or, use your choice of herbs and seasonings. Transfer the turkey to the oven and roast at 450°F for ten minutes, then reduce the temperature to 425°F to finish the roasting. The meat thermometer should read 150°F at the deepest part of the breast and 165°F in the thighs. Meanwhile, brown the turkey parts then add them and the remaining vegetables and chicken broth to a saucepan. They will be cooking while the turkey roasts making a rich, delicious broth. After the turkey has roasted and while it is resting, the vegetables from under the wire rack are added to the saucepan. All those vegetables with the drippings from the turkey really enhances the flavor to the simmering broth. This is how to get that rich, deep brown color with lots of flavor. After transferring the rack with the roasted turkey to another baking sheet, increase the oven temperature to 450°F again. Return the baking sheet with the roasted veggies to the hot oven. Continue to roast the vegetables for another five minutes or so, getting a char over the tops. Then remove them from the oven and add them to the saucepan. Be sure to scrape off all those brown bits as well! Spatchcock Turkey is easy to carve. Finally, the broth is strained and thickened resulting in that awesome gravy. The turkey is carved and dinner is served! 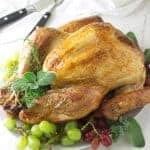 Spatchcock Turkey is a delicious, moist, beautifully browned bird and one of the easiest methods ever! 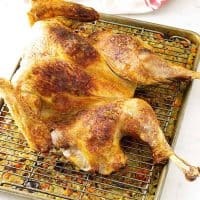 The skin in a spatchcock turkey is crispy and the meat is moist and tender. The turkey giblets/parts are made into an awesome gravy. 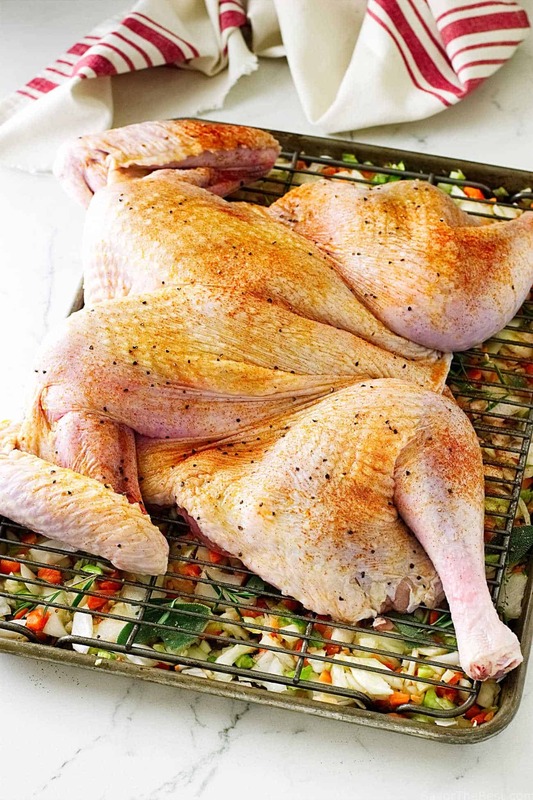 Prepare a baking sheet by coating it lightly with oil spray. Set aside. Spray a wire rack with the oil spray to keep the turkey from sticking. Add the chopped vegetables to a large mixing bowl and toss together to combine. Place two-thirds of the chopped vegetables to the baking sheet and drizzle the wine over them. Reserve the remaining vegetables for the gravy. Distribute the sage, rosemary and thyme sprigs on top of the vegetables. Adjust the wire rack over the vegetables and set aside while preparing the turkey. Remove the backbone with kitchen shears or a sharp knife, cutting along each side of the backbone. Turn the turkey breast side up and press down on the breastbone firmly. You should hear the breastbone crack and feel it give a little. Reserve the backbone, tail, neck and giblets. Rinse the inside/outside of the turkey and sprinkle lightly with salt. Arrange the turkey on the wire rack flattening the turkey out as much as possible. Turn the wings under and position the thigh/legs towards the body. With paper towels, wipe the turkey dry, then brush with the olive oil. Season with the salt and pepper then dust with paprika if using. Transfer to the middle position of the oven and roast for 10 minutes. 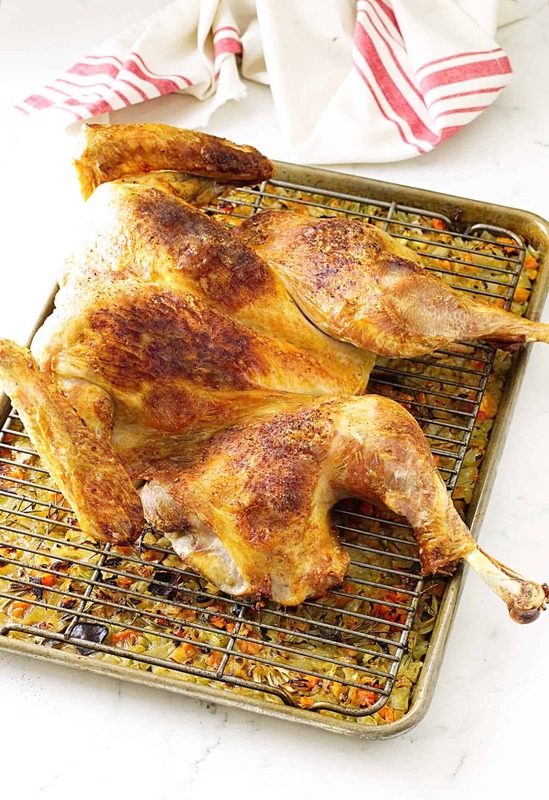 Reduce the temperature to 425°F, continue roasting until an instant-read thermometer reads 150°F in the thickest portion of the breast and the thighs reads 165°, about 70-90 minutes, depending on the size of your turkey. Cut the backbone into several pieces. Heat the remaining olive oil in a large saucepan over high heat, add the backbone pieces and the reserved giblets. Cook, stirring frequently until they achieve a rich brown color. Add the reserved raw vegetables and cook, stirring occasionally, until they become soft. Add the chicken stock and the wine, bring to a boil, reduce heat to low and simmer for 30-40 minutes. Remove it from the oven and transfer the rack to another baking sheet. Tent the turkey with foil and allow to rest for 20 minutes before carving. Add the roasted vegetables from the sheet pan into the saucepan of simmering turkey stock and continue simmering for another 10-15 minutes. Remove the saucepan from the heat and strain it through a fine-mesh strainer set over a large bowl, press down to release as much liquid as possible. Discard the solids. Measure the liquid into a 2-quart saucepan, 3 cups of liquid will be needed for the gravy. Spoon off as much of the surface fat as possible. Place the saucepan over high heat and bring to a boil. Remove from the heat and whisk in the butter-flour mixture. Return to the heat and continue whisking until thickened, 2-3 minutes. Cover the saucepan until ready to serve. A strip of folded foil wrapped around the end of each drumstick will prevent the tips from browning too much. For even browning, turn the sheet pan a couple time during the cooking process. If the vegetables under the rack begin to scorch or burn, add an additional half-cup of water. BeurreManié is a paste made with equal parts soft butter and flour. When it is whisked into a hot liquid, the butter melts, releasing the coated flour particles without creating lumps. This is a wonderful French process for finishing sauces to a smooth, silky consistency. Spatchcock Turkey, moist and delicious. Great video and tips! This really is an ideal way to prepare a turkey especially when having a huge crowd. Cooking time is less and when not everyone cares to see the whole bird sitting on the table before slicing. I love your video and all your tips and the fact that you set all your veggies below to blend with the juices of the turkey. Beautifully done!